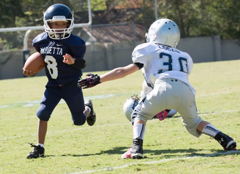 The Marietta Youth Football League will be one of discipline, character, and respect. Athletes and Parents are highly visible in the school and community and serve as role models for others. 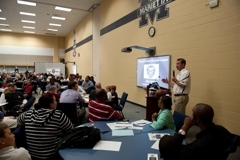 Therefore, Marietta Youth Football League expects its Athletes and Parents to act in accordance with their positions as representatives of Marietta Football and Cobb Football. Questions regarding inappropriate behavior of an Athlete or Parent will be checked out thoroughly and may result in disciplinary action and/or expulsion from the program. 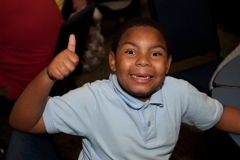 In addition, an Athlete may be excluded from future participation in our program. Arrive by 6:30pm for Team practices to begin. Park in the upper parking lot on the MHS campus and NOT park down by the fields for either games or practices. Do Not bring any Pets on to the MHS campus at any time. Not enter the practice or game field at any time. Refrain from excessive sideline coaching and will support their team's coaches. Refrain from using any profanity. Abide by a doctor's decision in all matters of player health and physical ability to play. Accept all decisions of officials on the field as being fair and called to the best ability of the officials. Not criticize an opposing team, its players, fans, coaches by words or gestures. Encourage their child to engage in proper sportsmanship conduct at all times with all coaches, fellow players, and officials. The MYFL board partnering with the MCS Head Athletic Trainer, is alerted if severe weather is within 10 miles of the MHS campus. Specially, the MYFL president and the Tackle Athletic Director are updated when severe weather, including lightning is within the 10 mile radius of the campus. If severe weather is in the Marietta High School area prior to a designated practice or game event, the MYFL board will send out a “cancelled” or “delayed” TEXT using our REMIND system. If the event is delayed, please know that we must wait at least 20-30 minutes before determining if we can resume – you will hear nothing during that time, but we will update you as soon as possible as to whether we can resume, or will finally cancel. Before the scheduled event, if there has NOT been a TEXT sent out by the MYFL or received on your registered phone, parents should assume the practice or game event is still on. Please move in that direction until you receive a text. If the event is still on, please remember you should NOT drop your player or cheerleader off at MHS and leave, you must stay on the campus during the event, in case further weather issues arise (as your player should not be there without an adult in charge under any circumstances). If you arrive at MHS and we are in a holding pattern due to rain or lightening, please do not send your player down to the field. 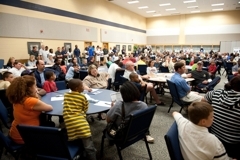 There is no space for players or parents to gather safely while waiting for weather to clear. PLEASE remain in your cars in the upper parking lots of the campus and await a REMIND TEXT indicating that it is all clear for practice or game to begin or resume. Parents must register at least one parental phone on the REMIND System in order to receive the MYFL Severe weather updates. These will NOT go out via email. Please see the instructions below for the REMIND system. 1. Emails to the email accounts established on your player's/cheerleader's registration account. 2. Printed flyers handed out during practice times by team moms and board members. 3. Texting (see below). This method will be what is used to communicate important information to parents such as severe weather updates related to practices or games. We welcome your feedback about our program. Please contact us at myfl.information@gmail.com with your questions, comments, and suggestions.